I have had the pleasure of being in school near, or live near the fabulous #2-5. I went to college near Herrell's and what ever money I had left over at the end of the week, I would treat myself to some Herrell's chocolate ice cream. It was rich, creamy and dense. Oh, those were the days. I worked near Bassett's, the longest continuously running ice cream counter in the USA. On occassion, I walked over to Reading Terminal Market and straight to Bassett's for a little chocolate ice cream treat during the summertime heat in Philadelphia. Oh, and the University Creamery, when I was at Penn State, the old Creamery location was in the center of campus. Twice a week, I had to walk from one corner to the other, and walk straight by the Creamery. On Thursday, on my way back down from my 2nd class, I would stop into the Creamery for an ice cream cone, or the fresh yogurt. Oh the yogurt mixed with strawberries was the original smoothy, before the smoothyking chain ever happened. The PennState Creamery has taught a lot of the world famous ice cream makers to make ice cream, as an example Ben and Jerry learned their craft from PennState. I love PennState, love the Nittany Lions, and I love thinking about the PennState Creamery tasty goods. And for #5, I have had chocolate ice cream at Dave and Andy's near the University of Pittsburgh. When I go on my food tours of Pittsburgh, Dave and Andy's is a must for my tastebuds. Again, the chocolate ice cream is dense, dark and rich. Mmm mmm yum! 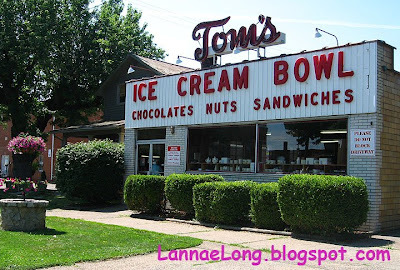 So, for years now, I have been wanting to go Tom's Ice Cream Bowl in Zanesville, OH to cap off the Top 5 Best Ice Cream joints in the USA, but I never happened to be in Zanesville. I mean, Zanesville isn't really on the way to anywhere, and I had no real reason to ever go to that part of Ohio before. So, a couple weeks ago, I found myself needing to go to Zanesville. Yup, Zanesville, OH. If you are not from OH, you probably don't know this small town, there isn't much there beside a strip of chain restaurants and big box stores, and this little gem of a diner and ice cream parlor. The menu is simple, burgers, fries, Campbell soups, and a few other items. To drink, they offer Phosphates, and then other dairy and soda items. 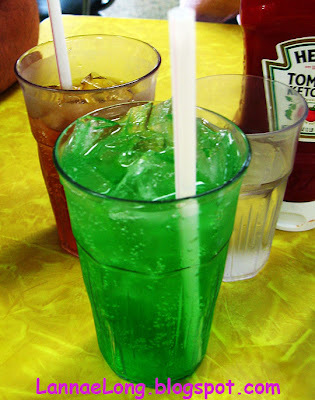 Phosphates are carbonated water with flavored syrup and a little phosphoric acid to make the drink more fizzy and give the finish a nice acid bite. The lime Phosphate I had was delicious! 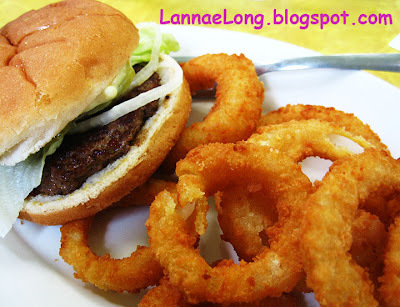 I got a hamburger and onion rings, and I was happy with both. The hamburger is about the size of a regular (small) McD's burger. Tom's does not serve anything with tomatoes, so the burger toppings are lettuce, onion, pickles and special "homemade mayo". Tom's probably does not make mayo, but rather I believe a little horseradish is blended into the mayo to give it a little kick. The onion ring portion was not overly excessive either, so I think the meal was well proportioned. Not too much and not too little, and it left me with enough room for a scoop of ice cream. I, of course, got chocolate. It was not overly chocolate-y or sweet (just the way I like it), but it was a very dense chocolate ice cream with a high fat content. The next time I was at Tom's I got a chocolate milkshake. I really like it too because it was made to the correct consistency, so I can either drink it with a straw or use a spoon. Because the ice cream is not too sweet, just perfectly sweetened, the milkshake was perfectly chocolate-y and the right amount of sweet. To make my time at Tom's even sweeter, I ended my stay by taking away a dozen pieces of Heggy's Candy. I got 12 handmade haystacks that I am still eating today. Heggy's is a local chocolate maker, and you can just tell that these taste better with fresher ingredients than anything you get in the big box store. Yeah, now that I had the top 5 ice creams, I was thinking that vacations may have to be focused on the best food in the USA. I will have to browse the americasbestonline.net for ideas of where I should go for my best food vacations. I am thinking burgers, hot dogs, or maybe pizza. Which list should I try next? We have been trying to eat earlier, so we don't go to bed on a full stomach. Somewhere along the journey, I heard if you eat late, you convert that food into fat stores rather than use it as fuel. Also, we have been spending a lot of time in the Eastern Time Zone, so if we eat dinner at 8 pm Eastern, it is really only 7 pm Central. That is why we don't generally eat at F. Scotts because if we eat at F. Scotts, we want to do the Nine Dine. After 9 pm, the food menu becomes 1/2 price (except for an occasional special dish will be full price). What a deal. In visits past, I got lobster ravioli with lump lobster meat and saffron sauce for less than $15 with the full price being twice as much. At Nine Dine, we still got the same great service as 1/2 the price. When we went in this time for Nine Dine, we saw most of the menu was local and local organic from some of the farms I source my food at home. If you recall, I did an "Eat Local" challenge for a week, when I ate only locally grown foods from 100 miles of my house. When I do cook at home, for a 3rd year in row, I am still using at least one ingredient or more that is local, within 100 miles. What I discovered is the local meats, veggies, fruits, bacon (OMG! so dang good! ), eggs, milk, and corn meal all taste so much better than any industrially made foods. So, when I saw that F. Scotts' Chef Will Uhlhorn has made the same turn to local purveyors as I did, I was thrilled and knew I had to blog about this meal. Here is a little tidbit of info that may stun you for a second, as it did me. Industrial butter pats, and industrial butter that is in bricks from restaurant food distributors have MSG and yellow dye in it. The MSG is a small amount, but none the less, MSG created in a lab as an additive (not naturally occurring MSG)! So, when you go out and want to slather the butter onto you bread at industrialized chain restaurants, it is because of the irresistible flavor enhancer MSG. So, Chef Uhlhorn makes his own butter from heavy cream he gets from one of the local organic milk providers. I couldn't tell how much better the real butter tastes at F Scotts. Thanks Chef for making real butter for me! Anyway, this night, looking at the list of farms, Bonnie Blue, Doe Run, Emerald, Glen, Farmer Dave, Hap Heilman, Howell, Hungry Gnome, Timbertop, Benton's Smokey Mountain, Delvin and Eaton's Creek, I was impressed. I know about 1/2 of these farms and farmers, even been to see the farms, and I feel very comfortable eating these foods from these farms. I like to eat tasting plates rather than one large meal, so I got a bunch of appetizers instead of a large plate. In addition to the above photos, I got a salad made with grilled shrimp, avocado, Boston Bibb lettuce and a lemon sherry vinaigrette and crispy feuille de brek. 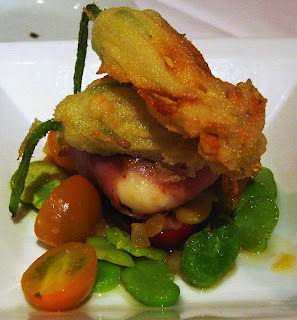 The lighter than tempura squash blossoms were delicious. The local country ham wrapped goat cheese was a local organic take on Italian cheese wrapped in Parma Ham. I like them both, but I really like the local take on it because it tasted so authentic, real, and heart felt. 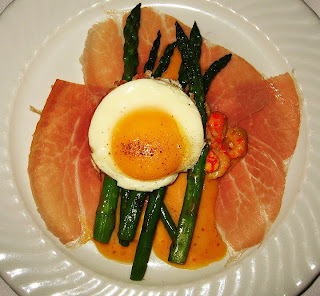 The local country ham and local poulette egg was just a fantastic dish too, and it was such a great local organic take on eggs benedict. The dish I really liked was the pomme frite served in a Belgian kind of way. 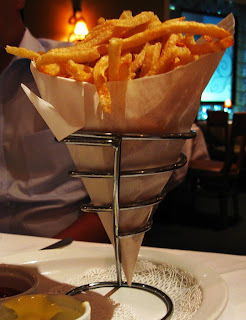 The frites this night was made with white truffle oil and Parma cheese, served in a paper cone. They are rich, and definitely are enough for 2 - 4 people to share. We brought some home, and the suggestion to heat them up was to grease the pan with some homemade, local or Amish butter, spread the frites on the pan evenly, and then heat in the oven until hot and crispy again. We did just that, and it was so dang good! Yeah know, I really like F Scotts and Chef Uhlhorn's food. I still am thinking about that lobster ravioli (over a year or 2 ago), and I am still thinking about the frites as some of the best food I have had ever. I also want to say, every single time I have been to F Scotts for Nine Dine, I have had excellent service, excellent wine suggestions, and excellent food. I have had only delicious dishes here (not to be confused with SNL's Delicious Dish). scroll down to the bottom of this post. The sign says so -KING. This is food fit for a king. The situation here is that the Asian market has a dining space in the back with a kitchen. There is a separate cafe pay station from the the regular market. There is also another funny thing, this market and cafe venue also has a jewelry store too. If you were looking for some squid, soy sauce, yams, noodles and quail eggs, you can get them here, and stop into the cafe for a little snack, the go get yourself some 18k gold. It is your one stop shopping! I am actually impressed with the visual cleanliness of this Asian market. The rows of dry goods are neat and tidy. There is a very neat and tidy produce section. There is a neat and tidy refrigerated and frozen section. There is a very neat and tidy jewelery shop. The cafe is also neater than some other East Asian restaurants I have been to in other parts of this country. So the story goes, I get this energized phone call from my fire eating friend and her family on a Monday after they ate at King Market and Laos Thai Cafe. They insisted on me meeting them at King the next evening after work to dine there. They called a bunch of their other friends to join them on Tuesday. So, we all show up, and walked into the market an followed the signs for cafe hanging from the ceiling. The cafe was filled with a lot of East Asian customers, us and a cop. This is a family owned business, and the table staff are the the 20 something aged kids of the cook and dish washer. The kids are so friendly, and are so happy to see people enjoying their food. The kids took a lot of time with us to describe the dishes we had questions about. They were so nice! I should know they were nice because I actually went back 3 times this past week! LOL! We ordered fresh coconut juice, fresh squeezed cane juice, spring rolls, tom ka gai, chicken larb, pad mee kao, green curry, papaya salad, and pad sen lon. When we were done with the coconut juice, they broke open the coconut for us to eat the white juicy flesh. What fun we had with coconut. The cane juice was sweet, but not so over the top sugary. It was refreshing. The spring rolls are like fresh Thai or Vietnamese rolls, but the dipping sauce is just a bit different, it is Laos style dipping sauce. The tom ka gai was made fresh for us, and was enough to serve 6 people. Don't worry, if you don't finish it, they have to-go containers for soup. Or better yet, bring your own quart jar and take your left overs home with you. The soup was really smooth, not a lot of salt was used, not a lot if fish sauce was used, so I enjoyed it. 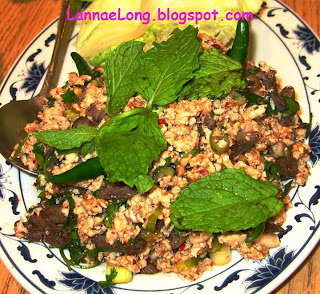 As the young lady dropped of the larb to our table, she mentioned that the chopped chicken meat also includes chicken livers. The dish was spicy and yummy. The pad mee kao is made with dried rice noodles, and is the most popular dish they serve. This one was spicy spicy spicy too! 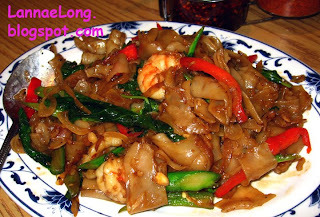 Pad sen lon is made with clear bean thread noodles and some Thai basil, spicy spicy spicy too! But, the dish of resistence was the papaya salad. It was julienned green papaya mixed with red and green hot peppers. One taste for me, I started to sweat. Fire eater is the only one who could eat this dish. She turned a little rosy in color, but she ate it like a regular green salad. I have come to understand that Laotian food is even more firery than Thai food! If you go and order Laos style hot, you are asking for a burn more than any other burn you have ever experienced. It is hot! Here is a little secret. It is true, and you may have heard of this before. If you go to an East Asian restaurant, like a Chinese restaurant in Boston, New York, Philadelphia, Chicago, Los Angeles (I know by experience) there is a hidden menu that only people in the know. There is at least Asian restaurant in Nashville that I know of that has a secret menu. So, for the ones who don't know about the menu, they are relegated to the nasty sweet and sour Americanized food, and none of the real deal. The upswing about King is that all the English menu items are authentic Laos and Thai food. But, King also has a secret menu. They have noodle soups with a broad homemade rice noodle that looks like udon, and the broth and toppings are like tom yum and vegetables. 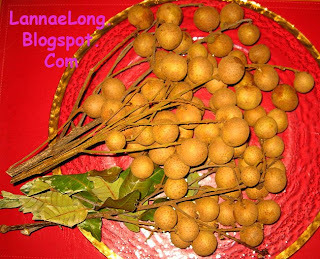 King will also cater to the "old world" clients who gather up some items from the grocery store, and mom in the kitchen will cook up whatever Laos or Thai dish the want. On Friday and Saturday, they have some East Asian delicacies that you cannot find anywhere else in Nashville. They offer balut, Laos style chitlins, pig feet and eggs in black vinegar sauce, house made roasted duck and an East Asian style roasted pork that I have not had in over a year. They also offer a variety of mangos, now that the stupid USA import ban has been lifted on all great mango varieties except for that one reddish green one. I really enjoyed the hospitality on all 3 visits last week. I enjoyed the menu items I opted for, and eventhough they are menu items, they were not "dumbed down" nor Americanized. They were straight forward Laos family home cooking. Next time, I am going to order from the secret menu and get a spicy noodle soup made with house made noodles. I am also going to try and get a roasted duck too. The ducks go fast, so I better get there early! The food pictured above are almost round. The diameter of the typical round thing is slightly larger than a quarter coin. The round things are tan with darker tan speckles. I would say the coloring is a bit like a russet potato. That is another hint, this food picture above has nothing to do with russet potatoes. The leaves and stems are not eaten. What is this food? Wait for the next post in the next couple of weeks for the answer.